During the time of the Prophet Muhammad, the Quran did not exist in the form that we have now. Parts of it were scattered among his companions. While he was alive, the prophet gave no instructions to his followers about compiling the recitations into one complete book. 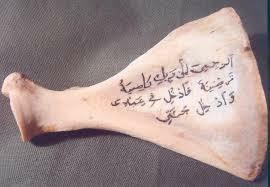 The verses of the Quran existed mainly in the recitations of the Muslims but some verses were written on stones, bones and leaves. The first name on the list is Abdulla ibn Mas’ud, whom Muhammad personally entrusted as an authority on the Quran. Ubay ibn Ka’b, another one of the four, was also singled out by Muhammad and was considered to be the best reciter of the Quran of the time. In fact, Ubay was known as Sayidul Qura’ (meaning The Master of Reciters). Umar, the third Caliph, also agreed that Ubay was the best of reciters. 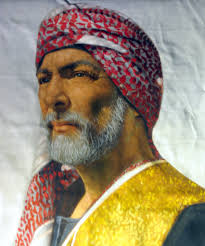 After Muhammad died in 632 AD, many Arab tribes revolted and some wanted to return to their old religions. This led to the Apostate Wars. (Ridda Wars). The caliph, Abu Bakr, went to war against the apostates. In one of these last wars, known as the Battle of Yamama, thousands were killed. By the end of the war, 700 reciters (hafiz) of the Quran were dead. This was a disaster and Umar, an upcoming leader and future caliph, foresaw the problem and realized that one day all the reciters would die. Without the reciters, there would be no more Quran. So he approached Abu Bakr, the caliph at the time, to suggest that the Quran be compiled into a book. Abu Bakr, who had been the closest companion of Muhammad, was deeply troubled at this suggestion and said, “‘How can I do something which Allah’s Apostle has not done?” But Umar kept on arguing until Abu Bakr was persuaded. Now instead of going to the four teachers that Muhammad had personally selected, Abu Bakr decided to go to Zaid Ibn Thabit, who had been a scribe of Muhammad, to ask him to compile the Quran. Zaid was shocked and said, “How dare you do a thing which the Prophet has not done?” They argued until they persuaded him too. And so Zaid Ibn Thabit, who was NOT one of the original four who were entrusted by Muhammad, began collecting those scraps of verses found on stones, leaves, bones and from the memories of men. Then he wrote it all out on to sheets of parchments. What were the reactions of the four, whom Muhammad had personally chosen and entrusted with the words of the Quran? Obviously, they were upset and angry because they were not consulted by Abu Bakr nor Zaid ibn Thabit. What did they do? Many of these early well-known scholars and reciters, including Ibn Ma’sud, Ubay bin Ka’b, Ali, Abu Musa, al-Aswad, and others rejected Abu Bakr’s ‘project’ and wrote their own versions of the Quran too as taught them by the prophet, separate from Zaid ibn Thabit. (According to research there are listed 15 primary versions, and a large number of secondary versions which were derivatives from the primary ones). Remember, by this time, Muhammad was no longer around and there was no other prophet who could approve or disapprove what they were doing. And none of these people were prophets. Meanwhile, Zaid worked on his compilation under the instruction of Abu Bakr. After he completed it, the copy was handed to Abu Bakr for safe-keeping. After Abu Bakr died, the copy was passed to Umar al Khattab, the second Caliph. “Let no one of you say that he has acquired the entire Quran, for how does he know that it is all? Much of the Quran has been lost, thus let him say, ‘I have acquired of it what is available’” (As-Suyuti, Itqan, part 3, page 72). After Umar died, his daughter Hafsa inherited the copy and kept it under her bed. Many years passed, and Uthman, the third Caliph, who had succeeded Umar, began to realize that by this time, that many differing Qurans had surfaced! The verses was being recited differently because of different dialects and even the contents were different in different regions and this was beginning to cause major disputes among the people! In the Kitab al-tabaqat vol 2 p444 – Ibn Sa’d says, “The people have been guilty in the reading of the Quran because of differing recitations.” This was especially evident among people of Sham and the people of Iraq. The differences were so great , not just in the pronunciations but in the content itself which differed. It was so serious that Uthman feared that in the future, no one would be able to know which is the true Quran. So once again, history repeats itself and the Caliph Uthman, out of frustration commissions Zaid ibn Thabit again to re-write the new “official” version. Why didn’t he just use the copy that was under Hafsa’s bed? The one that he had originally compiled under the direction of Abu Bakr? No, that wasn’t good enough according to Uthman. It had to be a “cleaner” final edited version so that there would be no more disputes. One of the problems that existed in the texts was that in the early version, there were no dots and spaces between the letters and also no vowels. This can cause huge confusion. For example, the difference between the letters “ba”, “ta” and “tha” are just the number of dots! So without the dots and spaces, any word could be made to be some other word. Throw in the missing vowels and you get endless possibilities! Uthman wanted this corrected. So Zaid used his version, comparing it with Hafsa’s version and added the necessary punctuations and vowels. In case there were differences, Uthman ordered Zaid to just use the version that the Quraysh tribe used. How can he just pick and choose which variant to use? Isn’t this supposed to to be the words of Allah? Again, remember, Muhammad was long dead and there were no prophets to guide Zaid ibn Thabit. And, he did not consult the authoritative scholars chosen by Muhammad and entrusted with the words of the Quran. Once Uthman’s version was completed, known as the Medinan Codex, he ordered that they make copies and sent to all the metropolitan centers, Mecca, Damascus, Kufa, Basra and one copy was kept in Medina. Where are these original copies now? No one knows. And no Muslim has been able to produce one to silence all the non-Muslim critics. This is said to be in the 7th century. How can such important, valuable and obviously revered copies go missing? Uthman did something even worse! He ordered that all versions of the Quran differing from his Quran to be destroyed! 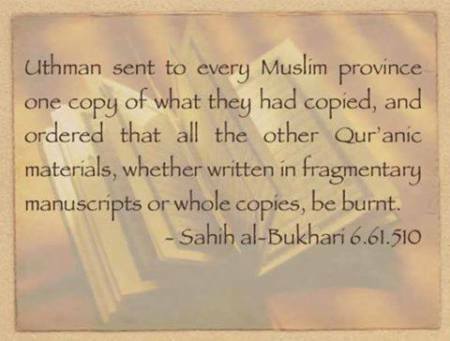 Why was there a need to burn these manuscripts of the Quran? How can Uthman be sure that he has not destroyed forever the one true Quran? He was indignant that he was right. This makes sense because, according to Muhammad’s own words, Ibn Mas’ud was one of the chosen teachers whom Muslims were commanded to go to when learning the Quran. Ibn Mas’ud’s Quran had 111 Sura (chapters). Uthman’s version written by Zaid had 114. “The people have been guilty of deceit in the reading of the Qur’an. I like it better to read according to the recitation of him (Prophet) whom I love more than that of Zayd Ibn Thabit. By Him besides Whom there is no god! I learnt more than seventy surahs from the lips of the Apostle of Allah, may Allah bless him, while Zayd Ibn Thabit was a youth, (before embracing Islam) having two locks and playing with the youth”. It was obvious that Ibn Mas’ud despised Zaid and rejected his version of the Quran. Clearly, Zaid was no match to such a great scholar and teacher as himself, Ibn Mas’ud, and such sermons by him are devastating to the history of Islam and to the authenticity of the Quran. Another of the original four that Muhammad had hand-picked and entrusted with The Quran was Ubay bin Ka’b, acknowledged as the best reciter of his time. He too was greatly disappointed with the “new” Quran. Ubay’s version had 116 Surahs. Ubayy, in fact, agreed more with Ibn Mas’ud’s version rather than Zaid’s (Uthman’s) version. We know that, whereas Ibn Mas’ud omitted two surahs (113 and 114) from his version, Ubay included two extra surahs, al-Hafd (the Haste) and al-Khal’ (the Separation). Where is Ibn Mas’ud’s Quran? And where is Ubay’s Quran? Gone. Burnt by Uthman. How can we make comparisons and see which version is genuine now when all the evidences have gone up in smoke? Before the destruction of the manuscripts, some Muslims preferred the versions other than the Uthman version, for example, those of Ibn Mas’ud, Ubay ibn Ka’b, and Abu Musa. All those versions have disappeared in time. But you’d be mistaken if you thought that the text we have today is perfectly Uthman’s Revised Version of the Quran. Not really. There were further changes made by Al-Hajjaj Ibn Yusuf Al-Thakafi (died 714 AD). At present in modern Islam, TWO versions seem to be in use and currently in print, named after their respective 2nd-century transmitters Hafs (from Kufa) and Warsh (from Medina). The Hafs text is more common and used in most Islamic countries including Saudi Arabia and Egypt. Warsh is used mainly in West and North-West Africa as well as by the Zaydiya in Yemen. 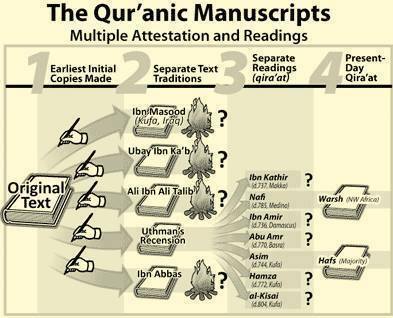 Many Muslims don’t even know of the existence of these different versions of the modern Quran. Or they will argue that it is only some minor differences in pronunciation or spelling. (Minor or not, the claim that the Quran is perfectly preserved goes out the window.) But the evidence shows there are more than just differences in spelling and pronunciation. The very best scholars and reciters during the time of Muhammad like Ibn Mas’ud, and Ubay bin Ka’b, whom Muhammad himself had personally approved of, rejected the Quran of Uthman, which they were never consulted on. So what do we have? Has the Quran been perfectly preserved? The answer is no.